After upgrading to Update Release 6 (UR6) we got the same issue as seen in earlier UR’s. It’s not possible to connect to VMM in AzurePack so you can’t see your Virtual Machines, Clouds or Networks. 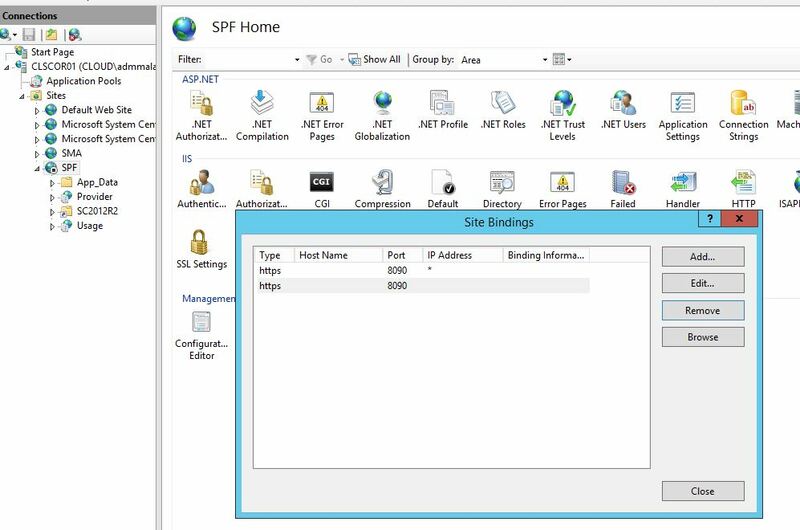 The SPF Website is not running and you can see two Bindings. In my case, one has a certificate and the other doesn’t. So I just remove the binding without a certificate. Then start the Website and everything is working as expected again. In earlier UR’s I’ve also seen how there is no bindings at all listed here. So you may have to create some binding then.